Welcome to the OEM Store Guide. Click the topics below to access the information you want directly. This is the first page of the OEM STORE. 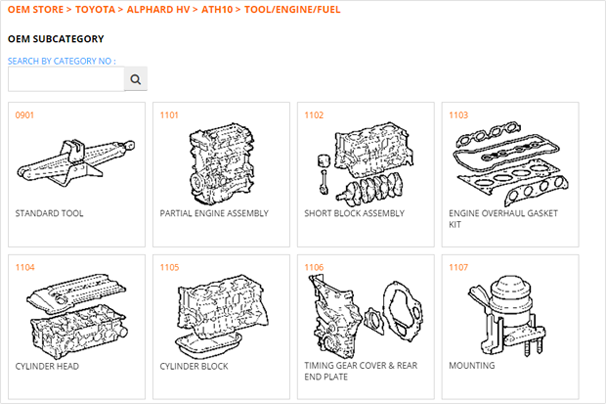 Search by Catalog or by Part Number and if the Part Number is not found, you can request it from the request button on the bottom of the page. 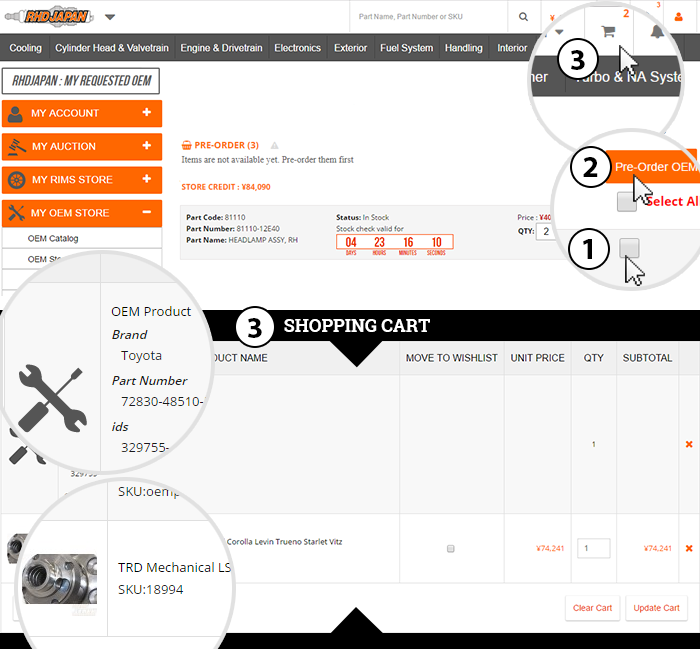 If you already know the Part Number, use the form below ‘By Part Number’, if your part number exists your search results will show you the CHECK STOCK AND PRICING page. You can also browse available catalogs by clicking on a logo. 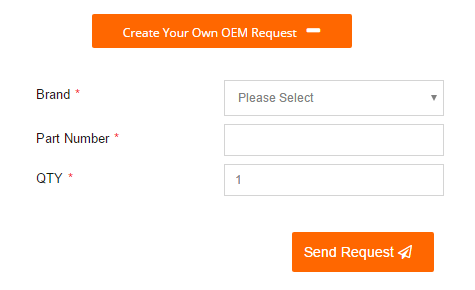 If your search is unsuccessful you can create YOUR OWN OEM REQUEST. Be sure the format is the exact OEM format when requesting and searching. Navigating the different pages in the Catalog. 2 ) Choose the vehicle specifications. 3 ) Choose the category. 4 ) Choose the sub-category (cf image on left). 5 ) CHECK STOCK AND PRICING. Before purchasing is possible, we need to check stock and pricing on the OEM items you want. Check stock and pricing. 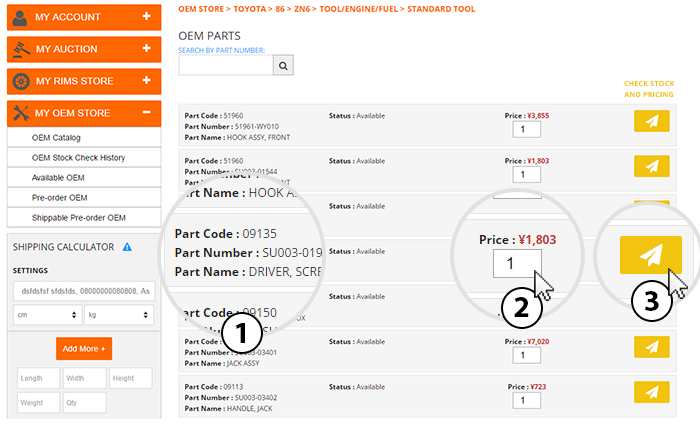 You can see your personal stock checks in the OEM STOCK CHECK HISTORY. Sometimes the OEM has been checked already and is available so you can add directly to cart. But most times you will need to check stock first. You can see the status of your requests. Every time the status is updated you will receive an email to inform you of an update. The status are visible only if one of your request have the concerned status. What does the status mean ? 2) Pre-Order : PRE-Order OEM do not have shipping dimensions, they must be purchased with store credit. 4) Expired : The quote request is no longer valid. Please re-check stock levels. 5) Not Found / Discontinued : The part number is not found or no longer available from the manufacturer. These OEM items have stock and pricing checked and we know the shipping dimensions. You can purchase directly with shipping included in one payment. Is the part in stock and how long is the quote valid for. Verify the OEM you want is correctly selected. Add to cart and check shipped price in the shopping cart. PRE-Order OEM do not have shipping dimensions, they must be purchased with store credit. If you do not have store credit in your account you can purchase it here. If you have already PRE-Ordered the item we will check it in and measure it so you can add it to your shopping cart and pay the shipping. You can add multiple items from PRE-Order to the shopping cart and ship them out together if you would like. Pre-order without shipping paid. You pay shipping after it is checked in to your account. Getting example dimensions is easier than you think. To estimate shipping, please measure a similar product on your car and add 2cm (1 inch) to each dimension and plug it in to the shipping calculator. You can test on the shipping calculator right here in this explanation to see how it works. 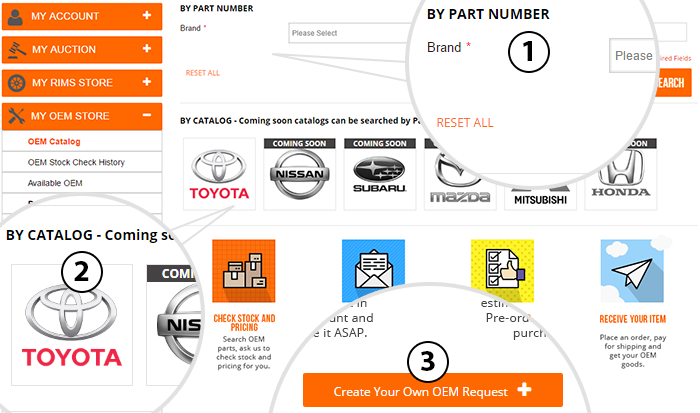 You can create YOUR OWN OEM REQUEST. Be sure the format is the exact OEM format when requesting or it will not work. Shippable Pre-order OEM can be added to the cart with regular RHDJapan and bidJDM items. Select your checked in Pre-Order OEM. Add to cart and continue shopping by adding RHDJapan or bidJDM items in the cart too. Only pay shipping on Pre-Order OEM together with the price and shipping of other store items. ONE THING TO NOTE HERE! Follow this order to do it correctly. (1.) Check stock on all Pre-Order OEM. (2.) Order all Pre-Order OEM FIRST. (3.) Get Pre-Order OEM checked in to your account. (4.) Check stock on non Pre-Order OEM. (5.) Order everything in same cart.